In its 2016 budget request, the White House inexplicably proposed to end two active, scientifically productive planetary missions: the Mars Exploration Rover Opportunity and the Lunar Reconnaissance Orbiter. NASA’s budget requested $0 for continuing operations of both missions. 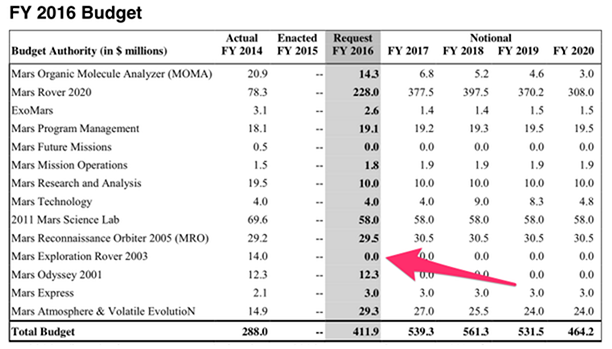 NASA’s 2016 budget request showing the $0 request for the scientifically productive MER Opportunity rover. Normally, this wouldn’t be a major concern. Congress has steadfastly supported these missions over the years, and intended to do so again in 2016. But these aren’t normal times in Congress. Instead of passing a budget for the year, it passed a temporary measure called a continuing resolution, or CR for short. On paper, a CR allows the government to continue spending at 2015 levels for a temporary period. In this case for two months, to December 11th. Last year, both Opportunity and LRO were funded, so the money should be there. But it’s not as simple as that. The Office of Management and Budget (OMB), the internal bookkeeper of the federal government, limits federal agencies’ spending to The White House’s proposed levels when those levels are lower than the previous year’s amount. For NASA’s Planetary Science Division, which manages Opportunity and LRO, the White House proposed a cut of $78 million in 2016. So in the current CR, the Planetary Science Division is restricted to spending at levels commensurate with the cuts proposed by the White House. On paper, that means $0 for Opportunity and LRO. Clearly, both missions have not yet been ended. 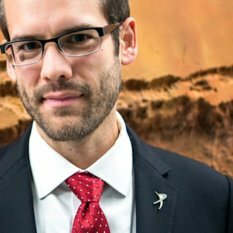 So I checked in with Jim Green, the Director of NASA’s Planetary Science Division to understand what’s happening with Opportunity and LRO. “Right now they’re ok,” Green said, noting that normal operations are continuing for both missions while there is so much uncertainty in the budget. Their future becomes “complex” if Congress can’t decide on a budget by December or passes a full year’s continuing resolution, which would extend 2015 spending levels through all of 2016. As to the future of Opportunity and LRO in that scenario, “that will require a discussion between NASA and the Office of Management and Budget,” Green said. Even if Green is given approval to continue Opportunity and LRO under a full-year CR, the money to support it will not necessarily show up. The $35 million required to operate the two missions would have to be scrounged from within the already-reduced levels provided to the Planetary Science Division, draining resources from other Mars missions, scientific research, or delaying future Discovery missions. It’s not that Opportunity and LRO aren’t returning good science, they are. In fact, they’re returning great science. Last year, an independent review of all planetary exploration missions ranked Opportunity and LRO as some of the most promising robotic mission in terms of near-term science return and recommended that they both continue. For now, both missions continue to collect priceless scientific data on Mars and at the Moon. But this level of budget uncertainty means a troubled future for both. The White House may have strategically assumed Congress would restore the money they zeroed out of these two popular missions, but if Congress can’t pass a budget for 2016, the termination of NASA’s only lunar presence and half of its rover fleet could be one of the many unintended consequences. What about New Horizons? They're going to do the KBO burn next week. Is it in the budget? How about DAWN? What a totally bizarre idea -- dumping Opportunity over ~$10m. Only a dozen years ago, all those responsible, and the authorities in numerous other countries, would have happily given several billion to successfully have even a single roving camera on Mars or any other planet. Opportunity is of course much more than that. But hey, yeah, we've successfully done, and are doing, so much roving over the surface of so many alien worlds -- time to get bored with Oppy and let her go. Nothing to see here folks -- move along. Weird. Everyone, please remember this cut comes from the White House -- the same President that Mr. Nye and Dr. Tyson are so happy to take selfies with are not funding two important missions. Please remember this -- The President is no friend of planetary science. It will take Republicans in the House to set this right, if they can. If they do, how about a few selfies with the real heroes of science and exploration, Mr. Nye? I'm not sure we should be celebrating the Republicans as the saviors of science. Their hostility and attacks against climatologists suggests that their attitude towards scientific research isn't all that great. Ok, first of all I need to be sure I'm getting this straight - I'm from Europe, and although I've read this blog and thus about how budgets are labored and handled please forgive me if I'm at times still confused. Budgets in the U.S. that are requested, i.e. assessed and handed over for passing, by the White House still have to go through Congress - but with a recommendation of $0, what is to be passed? The page I just read prior to this here was the White House's Space Exploration Pride-Tweets. One of them regarding Mars. So, that's just PR... (?) @ Mewo: Hi, and please remember I'm half-judging from afar. I agree with what you said, and I'd have voted Obama if I was a U.S. citizen. This said, at least in regards to the past decades there's been this quite strange phenomenon of the Republicans on the one hand being in collective denial about THE issue of climate change, while being when it comes to space exploration actually the better funders. I still wouldn't vote Republican, but it appears that at least for this sector the security for such missions has had a better history. Which, in the end, means nothing if the rest goes to all to..., of course. And please correct me if I'm wrong. But the White House should rethink its priorities. Seeing a 0 behind a successful mission is a scary view. In response to Mewo: I'm not saying Republicans are the saviors of science -- rather my point is that this Administration and this President have been no friends of science. Their track record is horrible. It's embarrassing to see the CEO and Board Members "kissing up" to the President (look, another selfie!) and having ZERO impact on the White House's plans. It's just kind of sad. And does not speak well of the Planetary Society in ways that are the opposite of Mr. Dreier and his very successful efforts. I've said it before and probably will again -- Casey Dreier for CEO! Are the funds being put toward another science program?